Malaysia Property News | Property Market In Malaysia: Oversupply of new launches? An artist’s impression of the Southbay City development in Batu Maung by Mah Sing Group. The planned development of RM29.6bil worth of properties on Penang island in the next 10 to 15 years has raised concerns over the capacity of the market to absorb them. The properties are planned for 1,121.56 acres which include reclaimed land and strategic locations on the island. Eastern & Oriental Bhd is reclaiming 740 acres for the second phase of the Seri Tanjung Pinang project in Tanjung Tokong to develop two islands for mixed development projects, which will have an estimated gross development value (GDV) of RM12bil. E&O is expected to reclaim the land in 2012 and the group has until 2019 to complete reclamation before the concession expired. “It should take two years from the start of the land reclamation before the first project launch can be embarked upon. “Phase two will be a mixed integrated development comprising two islands of approximately 740 acres. “At three times the size of phase one, phase two is expected to generate RM12bil in gross development value,” E&O deputy managing director Eric Chan said in a report. Chan said upon completion of the reclamation for Seri Tanjung Pinang Phase Two, it would take at least 10 to 15 more years to fully develop the land. “Within that time, with Penang continuing on its present growth path, the demand for better residential properties and lifestyle amenities is expected to be generated. “E&O will be poised to fulfil this demand with the realisation of Seri Tanjung Pinang Phase Two,” Chan said. Ivory Properties Bhd is reclaiming 35 acres to add to its recent acquisition of the 67.56 acres of Bayan Mutiara land in Bayan Baru for a mixed development scheme, which will have an approximate GDV of RM10bil, according to a recent AmBank report. IJM Land Bhd is reclaiming 103 acres for the development of an RM5bil mixed development project, which will be completed in 2021. IJM Land is expected to complete the reclamation of the 103 acre site next year-end. Mah Sing Group Bhd is developing properties on various prime locations on about 95 acres on the island, with an estimated GDV of RM1.6bil. From 2012 to 2017, Sunway City Bhd will be launching the Sunway Hill Residence on an 81-acre site in Sungai Ara around 600 units of landed properties and condominiums with RM1bil in GDV. There are also other smaller projects with combined multi-billion ringgit GDV such as the reclamation of a 100-acre site in front of Queensbay Mall by Boustead Holdings Bhd; new residential projects on the island planned by the other developers from Kuala Lumpur and Penang, and the proposed project by Penang Turf Club (PTC) on 50 acres on the PTC site. It is estimated that about 70% of the RM29.6bil in new developments will comprise residential properties. Last year, the purchase of new residential properties on the island was estimated to value around RM1.8bil to RM2bil, which was among the highest in recent years. 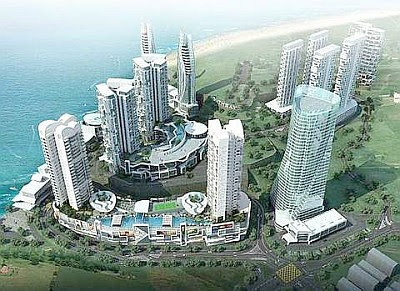 If the purchases of new properties on the island were to be maintained at the 2010 level of around RM1.8bil to RM2bil, industry observers said it would take 10 to 11 years to complete the take-up of the properties. Real Estate & Housing Developers' Association (Rehda) Penang chairman Datuk Jerry Chan Fook Sing said even if the uptake was consistently estimated at RM2bil per annum, the 10 to 11 years period would still be a long time. “This is assuming that the Penang property market can consistently absorb around RM2bil worth of properties per annum. “A RM21bil GDV is a lot for the market to absorb even if the period of uptake were to be extended to 15 years. “The planning and the launch of the projects must be timed to suit demand, although the demand of properties would be higher in certain areas of the island. “But of course if the economy continues to be good and there is consistent or increasing demand, there should be no problem for the new launches to be absorbed in a shorter period of time. “If Penang can continue to re-invent itself in the economic sphere, then it can draw people from other states to Penang to work. “This migration could serve as the source of demand for the future property launches and create a higher population as opposed to normal birth rates,” Fook Sing said. Registered and chartered valuer C.A. Lim & Co proprietor Lim Chien Aun said there could be downward pressure on property prices on the island due to the oversupply of new launches. “As it is, the bulk of properties purchased over the past five years were for speculation purposes. “When the holding power is gone, the speculators will have to release the properties into the market. Add that to the supply of new launches, there will be an oversupply situation. “Developers must identify where their markets are coming from carefully and release the new launches according to demand,” Lim said. Lim said for the past five years, the return on investment (ROI) for properties on the island had dropped by 50%, while the value had increased by about 100%. “This is something that had gone unnoticed. “The ROI is worsened by the fact that Penang properties generate very low rentals. “If the ROI keeps decreasing, as property values increases correspondingly, then no one would buy property in Penang for investment purposes. “The property market in Penang would then become purely speculative in nature,” Lim said. Lim added that there was also the affordability factor. “To purchase a high-rise property priced above RM300,000 on the island, the buyer's monthly household income would need to be between RM8,000 and RM10,000. “The bulk of wage earners in Penang do not fall into this income bracket. “Where would the demand for future property launches come from?” he said. Sunway City general manager Tan Hun Beng said the volume of properties planned for launch raised the question whether developers had done enough research and analysis on market demand. “I think developers should make the necessary studies before making their launch projections: is the present positive response to the property market a good sign or is it an early signal of an approaching storm?” Tan said. Chartered valuer and property consultant Azmi & Co (Penang) Sdn Bhd managing director Chandra Mohan Krishnan said the RM21bil GDV of residential properties was a lot to absorb over a 10 to 15 years period. “If there is no demand, there may be downward pressure on property prices. However, the value of landed properties on the island should be able to hold on, as they are becoming scarce,” he said. IJM Land (north) general manager Toh Chin Leong said it was important for developers to build a balance mix of residential and commercial properties. “Commercial projects are important to attract the movement of labour to Penang, which will provide demand for housing. Penang Master Builders and Building Material Dealers Association immediate past president Datuk Finn Choong said the reclamation works would generate demand for workers and jobs for local contractors. “We can see positive benefits for Penang even before the launch of the new properties. “The reclamation activities would bring in foreign labour to Penang which would generate economic spill-over effects for the state, as the workers would have to spend money on rentals and food. On paper the number of new projects seems a lot. “However, if the Penang government can continue inspiring confidence in investors and manages well the expectation of Penangites, the state can draw migration from different income groups into the state that can support the new properties planned,” Choong said. Henry Butcher Malaysia (Penang) director Dr Teoh Poh Huat said Malaysia's population stood at 28.3 million with an average annual growth rate of 2%. “Being a young population, 67% are between 15 and 64. Nearly everyone will be making decisions about where to live, work, shop and play, with real estate as the major key component for the next 20 years. “It is important to know a great deal about where they reside, educational backgrounds, family composition, incomes, and whether or not they work. “Consequently future real estate needs can be anticipated,” Teoh said. On the infrastructure supporting future development, Penang Chief Minister Lim Guan Eng said international contractors from several countries have indicated that they are interested to build four major road projects in Penang. Lim said the contractors were from China, Singapore, Hong Kong, Japan and South Korea. He said the state government would invite those interested to bid for the projects via request for proposals (RFP) by the end of the year. “The RFP will be out at the end of the year. It will take another six months before the contracts can be awarded to the successful bidders,” Lim said in an interview recently. The proposed projects are the 4.2km Gurney Drive-Lebuhraya Tun Dr Lim Chong Eu bypass, the 4.6km Lebuhraya Tun Dr Lim Chong Eu-Bandar Baru Air Itam bypass, the 6.5km Penang-Butterworth Tunnel, and a 12km proposed road connecting Tanjung Bungah and Teluk Bahang.